This concludes the “Smart Couples Finish Rich” book review. Let me know if you have any thoughts on this book. Chapter 4 – The Latte factor. This is the famous advice from the Automatic Millionaire where he basically says that cutting out a daily latte will increase your retirement savings by a huge amount – using a 12% return in his example doesn’t hurt either. Most of us think that small expenditures don’t matter but his point is that they add up to a significant amount. Mainly he suggests replacing small expenditures with cheaper substitutes that usually involve more labour and time. For example instead of a latte & muffin at Starbucks, you can have coffee at home and an apple. Instead of buying snacks at work – bring them from home. Lunch – you should brown bag three times a week and dinners are much cheaper if you are not eating in a restaurant or taking out. Obviously if you get most of your meals outside the home this will involve a major lifestyle change but the rewards can be great. Bach suggests keeping track of your spending for seven days in order to add up the costs of all the small expenditures and eating out. Chapter 5 – Build your retirement basket and pay yourself first. 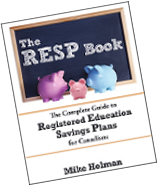 Good advice about contributing to your rrsp through a workplace savings plan where you can prevent the income tax from being deducted from the income you are going to contribute to the rrsp. His rule is save 10% of gross income to avoid struggling when you retire. He says you should save 20% to be ‘really rich’. And start early. His investment advice is not that great which is not surprising considering he’s a financial advisor. He suggests investing in mutual funds and not once does he mention costs or cheaper alternatives. He uses an 11% return for equities in his examples which is just not realistic. He also uses another financial adviser tactic which is to emphasize maxing out contributions to your rrsp without considering that maybe a couple’s debt might be more pressing. He says you have to invest at least part of your rrsp in equities which is good advice. Chapter 6 – Build your security basket. He suggests having at least three months worth of expenses in cash – look for higher interest and no more than 24 months worth of expenses. 24 months? By the time I could save that much, my retirement would be half over :). Some great suggestions about setting up a will. Get adequate life insurance. His estimate for life insurance was interesting – figure out the expenses of the survivors and buy coverage for 6-20 years depending on things like how old you are, how much debt you have etc. He suggests that term life is the best type of insurance which most of the pf world would agree with. His investment advice is quite good here, he talks about index funds and ETFs and DRIPs. Not sure why he didn’t mention them before. Chapter 8 – He lists 10 of the biggest mistakes that couples make – usual stuff – start investing late, over spending, blah, blah, blah. Chapter 9 – Increase your income by 10% in 9 weeks (why not 10 weeks)? I thought this advice was really dumb, however his advice about cleaning up your office and house and organizing everything properly is good. Some good career advice about putting yourself out there and seeing what your market value is, in order to make sure that you are not underpaid. All in all I would definitely recommend this book or the Automatic Millionaire since that apparently is the exact same book. I agree with most of your review and comments. What a funny world that we live in when somebody can write several books with the exact same ideas just applied to slightly different life situations and be very successful at it. I was talking to a friend this morning about Bach, and I agree that he’s very repetitious (same info in all his books). If his book convinces someone to live within their means, it’ll certainly have accomplished a lot however. MG – good point! I think David Chilton (Wealthy Barber) could learn a few things from Bach and put out a whole series of books with minor changes from the original. Mr. C – I agree. The book(s) is geared toward someone who is just starting to think about finances and doesn’t have much knowledge (and quite possibly, brains). For that person, it’s probably a good a book as any. Personal finance does not really have to be that complicated to be done right after all, so Bach is smart tapping into this lack of knowledge of the general public and perhaps almost to the point of intimidationg toward these topics. It is all about mass-marketing I guess. The McDonalds or Wal-Mart of personal finance literature. I guess I would rather be writing a mass market book than one that only sells 100 copies! I have always had a small issue with the Latte Factor argument. Most informal networking gets done over coffee and lunches. If having latte with the boss leads to a raise then its well worth the cost. Having said that, I do agree that wasting money on a lot of small purchases is not a good idea. That’s an interesting point TMW. That kind of cost is probably worth it.